What better way to get into the Halloween mood than with a desktop toy to usher in a daily reminder that life is but a moment, and we will soon end up as a bag of bones eventually. The Skeleton Seesaw is a great time waster, although I suspect your attention won’t be held for too long before you relegate this to a corner, letting it gather dust. 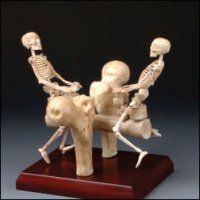 The Skeleton Seesaw retails for $34.95 a pop, which is rather pricey for something that has no electronics inside.